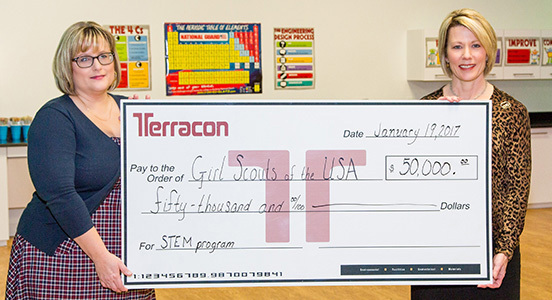 Karen Rieken, P.E., environmental services department manager in Terracon’s St. Louis office (L), presents the Terracon Foundation $50,000 National Partner Grant to Bonnie Barczykowski, chief executive officer of the Girl Scouts of Eastern Missouri, Inc. (R), who accepted on behalf of the national Girl Scouts of the USA headquarters. OLATHE, Kan. ­­– The Terracon Foundation is pleased to announce the award of $142,255 to grant recipients. The Foundation was established as the community investment arm of Terracon with a goal to reach out and become a real part of the lives of employees and the communities where they live and work. Employees complete applications which are then reviewed and decided upon by a volunteer board of professionals. The Terracon Foundation awards funds twice a year in the grant categories of community organizations and universities, a once-a-year grant to a national partner, and annually presents funds for scholarships supporting dependents of employees. To date, the Foundation has distributed almost $1.5 million in grant funds. The Girl Scouts of the USA (GSUSA) is the recipient of this year’s $50,000 national partner grant from the Foundation. The GSUSA works with 1.8 million girls through 800,000 volunteers in 112 councils in all 50 states and 92 countries. The grant will support the development, pilot, and rollout of a national engineering series, the curriculum of which is being developed in partnership with the Society of Women Engineers (SWE), last year’s recipient of the Foundation national partner grant. This engineering program is being piloted in 11 councils in nine states and Washington, D.C., beginning in early 2017. It will rollout nationwide in the fall. As part of an ongoing effort to support higher education, the Foundation also presented university grants for graduate-level scholarships, fellowships, and programs in the areas of science, technology, engineering, and mathematics. This year, the Foundation presented $52,500 to six universities: Alamo Colleges, San Antonio, Texas; University of Illinois, Urbana/Champaign, Ill.; University of Nebraska-Lincoln, Lincoln, Neb. ; University of Texas at El Paso, El Paso, Texas; University of Washington, Seattle, Wash.; and Virginia Tech Foundation, Blacksburg, Va.
Terracon also awarded $39,755 in community grants to 14 local, nonprofit programs in which employees are actively engaged with an emphasis on education and the built and natural environment. Recipients include: Bexar County 4H, San Antonio, Texas; Blue River Watershed Association, Kansas City, Mo. ; Community Culinary School of Charlotte, Charlotte, N.C.; Des Moines Social Club, Des Moines, Iowa. ; Diamonds and Fields, Parkersburg, Iowa; Explore Knowledge Foundation, Las Vegas, Nev.; Girl Scouts of Eastern Missouri, Inc., St. Louis, Mo. ; HawkWatch International, Inc., Salt Lake City, Utah; Iowa Association of Business and Industry Foundation, Des Moines, Iowa; National Institute for Construction Excellence-KC, Kansas City, Mo. ; Olive View-UCLA, Sylmar, Calif.; Rebuilding Together South Sound, Tacoma, Wash.; Spring Branch Independent School District, Houston, Texas; and Survive & Thrive, Raytown, Mo. Terracon is an employee-owned engineering consulting firm with more than 3,500 employees providing environmental, facilities, geotechnical, and materials services from more than 130 offices with services in all 50 states. Terracon currently ranks 32nd on Engineering News-Record’s list of Top 500 Design Firms. Visit terracon.com/about/foundation for more information.